Every morning, at first light, Java's rice fields come alive. One by one, farmers appear among the bright green plants, their wide-brimmed hats dotted across the fields. This is the way Indonesia's rice has been farmed for generations; the basic rhythms of its paddies undisturbed by war or economic crisis. But now, something strange is happening. Parto is one of the first in the rice fields every morning. 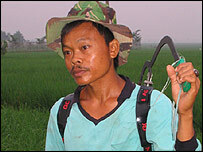 Carrying a can of pesticide, he swings the spray backwards and forwards over the crop. "The harvests have become irregular," he said. "Normally we harvest two to three times a year, but it depends on the weather. We need to wait for the right conditions, but now that's become unpredictable." Many small-scale farmers still plant and harvest their crops according to the stars, or the first few drops of rain. But this year's heavy rains washed away many crops and caused major flooding. Scientists cannot agree how much of this is down to climate change. But then that debate means nothing to many of those affected - they do not even know what climate change is. "We weren't told about climate change," one man told me, "and the only news we received from local officials is that a flood like this will happen every five years. I don't understand climate change, but I do know that a big flood will come every five years." "Climate change is caused by global warming," said his neighbour, "and the thinning of the ozone layer. I think that caused the shift of weather patterns on earth." A local woman joined in: "People here don't talk about climate change. I have read it somewhere in a book or in a newspaper, but I don't really know what it means." With 17,000 islands and a biodiversity second only to Brazil, Indonesia stands to lose a great deal from rising sea levels and changing climate. So why don't more people here understand it? At a popular seaside resort outside the capital, Agus Purnomo, senior adviser to the Indonesian environment minister, looks out across the Java sea and the unseen changes happening in the vast waters that surround his country. He told me the government here has some catching up to do. "The climate change issue is more perceived as an international issue rather than a domestic issue," he explained. "We need to start with the decision makers, the planners and also those who can approve the budgets - including the parliament - because we need to address this awareness campaign big time. And that will require substantial allocations of the national budget." It is already clear that the effects of climate change in Indonesia could be devastating. 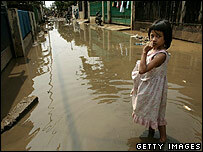 Many communities in Jakarta were hit by the floods earlier this year. Even now, walking around the areas that were affected, many houses have been completely destroyed or still carry high water marks on the upper floors. But some environmentalists, like Kuki Soejachmoen, head of the think-tank Pelangi, see disasters like this as a strange kind of opportunity - to educate people about climate change. "Since this happened, people have started to realise that this is not only the product of the local environmental impact, but it's something that's happening over the long term," she told me. And that is quite a change for Indonesia's poor majority. "Most of the people here - and in other developing countries I should say - are forced to live on a day-to-day basis so [have] a very short term perspective," she said. Floods might engage the victims of climate change, but what about those who cause it? Indonesia straddles both ends of the global warming debate. Forest fires have made it one of the world's worst polluters. Many fires are started by poor, remote communities, either as a way of clearing their own land for planting or on behalf of big companies. In order to stop these blazes, communities will have to be convinced to think beyond their daily lives. Changing Indonesia's attitudes and behaviour might start with the politicians, but they cannot do much without the co-operation of the country's vast population.